Diego Velázquez (1599–1660), The Waterseller (of Seville) (c 1620) , oil on canvas, 107.7 x 81.3 cm, Apsley House, London. Wikimedia Commons. By the time that Diego Velázquez and his wife had their first child, in the early summer of 1619, he had established the reputation of an up and coming provincial artist, thanks to his innovative bodegones (genre paintings centred on food and its preparation). One of his first commissions appears to have been a pair of religious paintings for the Convent of Shod Carmelites of Seville, both of which have survived the last four centuries unscathed. Diego Velázquez (1599–1660), The Immaculate Conception of the Virgin (c 1619) , oil on canvas, 135 x 101.6 cm, The National Gallery (Bought with the aid of the Art Fund, 1974), London. Courtesy of and © The National Gallery, London. 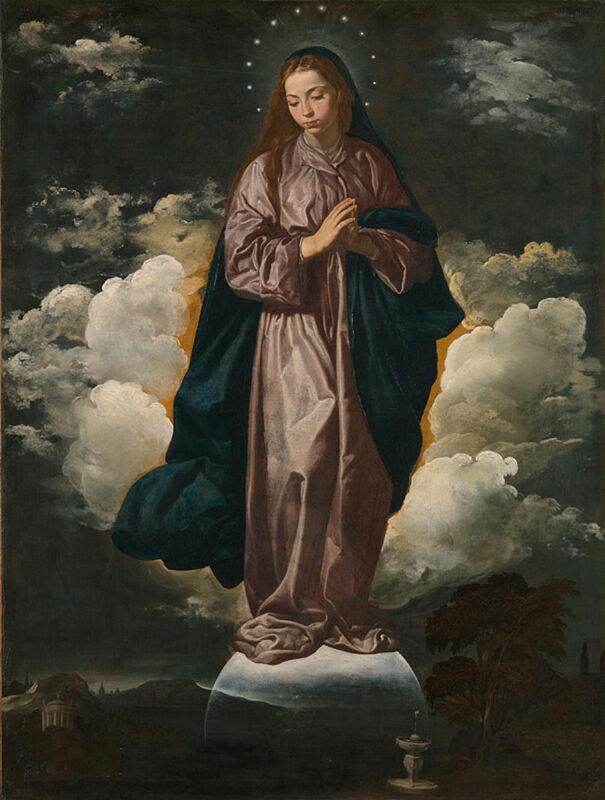 The Immaculate Conception of the Virgin (c 1619) is one of the earlier examples of this motif in Spanish art. This depicts the doctrine that the Virgin Mary herself was conceived without original sin. This was a controversial issue at the time, with the Carmelites of Seville campaigning in its favour. Interestingly, in 1620 Velázquez’s father-in-law wrote a paper on the subject. Although painted in a very conservative style, Velázquez shows the Virgin as if in a vision, standing on the moon, with the stars forming a crown around her head. Below her it is night on the earth, its trees and fountains appearing tiny beneath her. 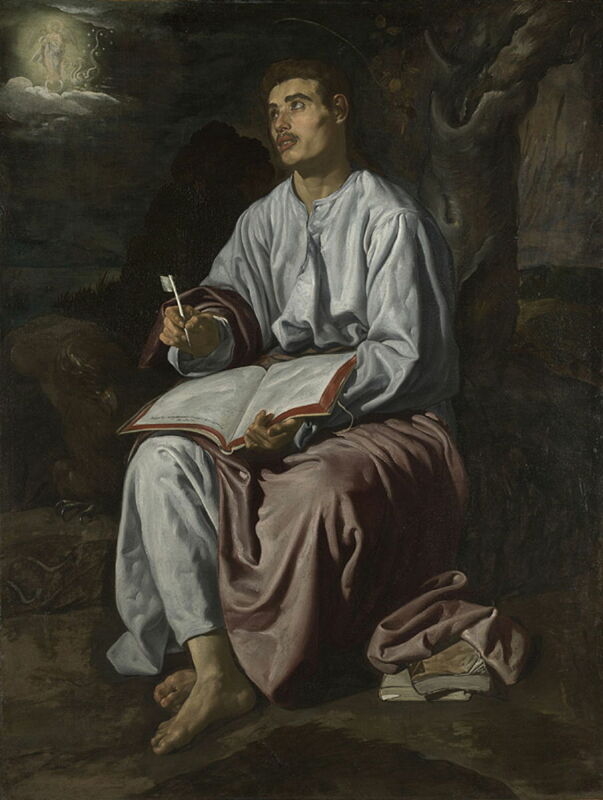 Diego Velázquez (1599–1660), Saint John at Patmos (c 1619) , oil on canvas, 135.5 x 102.2 cm, The National Gallery (Bought with a special grant and contributions from The Pilgrim Trust and the Art Fund, 1956), London. Courtesy of and © The National Gallery, London. Its pendant is Saint John at Patmos (c 1619), which shows Saint John the Evangelist while he was on the island of Patmos, writing his book of Revelation. At his right hand is an eagle, one of his attributes. He is looking up at the vision of the Woman of the Apocalypse at the upper left corner, a reference to Revelation chapter 12. Unlike his idealised and divine image of the Virgin, John is very clearly a local model and thoroughly human. 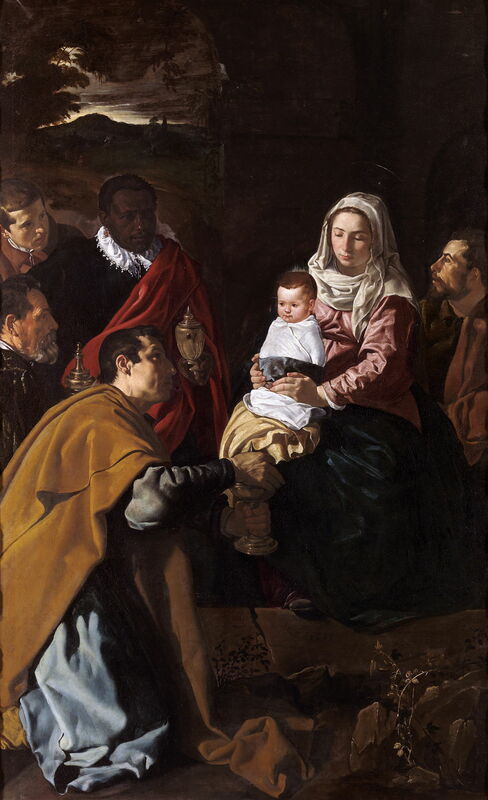 It’s thought that Velázquez was commissioned to paint this Adoration of the Magi in 1619 for a chapel in the Jesuit Novitiate of San Luis in Seville. This is one of his few dated works: although hard to read, the year is inscribed just below the Virgin’s feet. Unlike many of his contemporaries, Velázquez painted most of his figures from live models, and this gives them the impression of reality here. Coupled with the Tenebrist lighting, this must have appeared quite radical at the time. He was careful, though, not to cause offence: his father-in-law was charged with maintaining the moral standards of painters in Seville, and Velázquez went as far as covering the Virgin’s feet in his compliance. He also maintains distinction between the divine figures of Mary and Jesus, and the humans around them. Analysis has shown that this was painted in a conventional manner, using the popular mantellilo linen with a brownish ground which gives the dark tonality. Radiography reveals several significant pentimenti: Velázquez is thought to have made preliminary studies only rarely, and made most adjustments directly in his finished works. In early 1620, Velázquez took on his first apprentice, a mark of his establishment as a master in Seville. 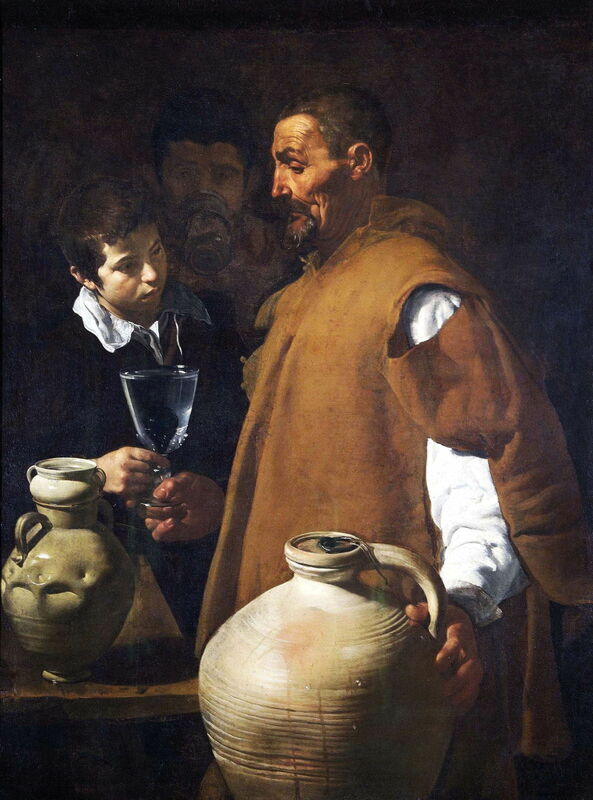 The Waterseller (of Seville) from about 1620 is another of Velázquez’s finest early works. The face of the waterseller shown in profile is expertly modelled, and the glass and pottery highly lifelike. It also confirms the artist’s continuing Tenebrist tendencies. Diego Velázquez (1599–1660), Kitchen Scene (The Kitchen Maid, The Mulatto Woman) (c 1620) , oil on canvas, 55.9 x 104 cm The Art Institute of Chicago, Chicago, IL. Wikimedia Commons. 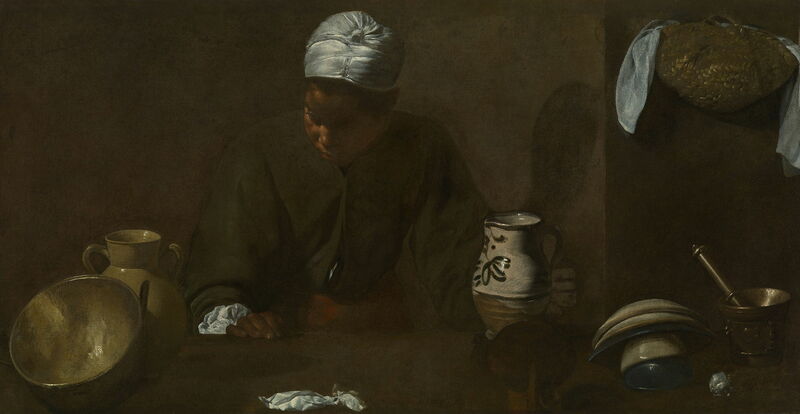 Kitchen Scene, variously known as The Kitchen Maid or The Mulatto Woman, from about 1620, is very similar to another painting attributed to Velázquez which has a small view of Christ in the House of Martha and Mary seen through an opening in the wall at the upper left. It is thus a bodegone, with impressive surface effects. Diego Velázquez (1599–1660), Francisco Pacheco (1620-22) , oil on canvas, 41 x 36 cm, Museo Nacional del Prado, Madrid, Spain. Wikimedia Commons. At some time between 1620-22, Velázquez painted this portrait which is now believed to be of his father-in-law Francisco Pacheco. This was one of several portraits which he completed at that time. 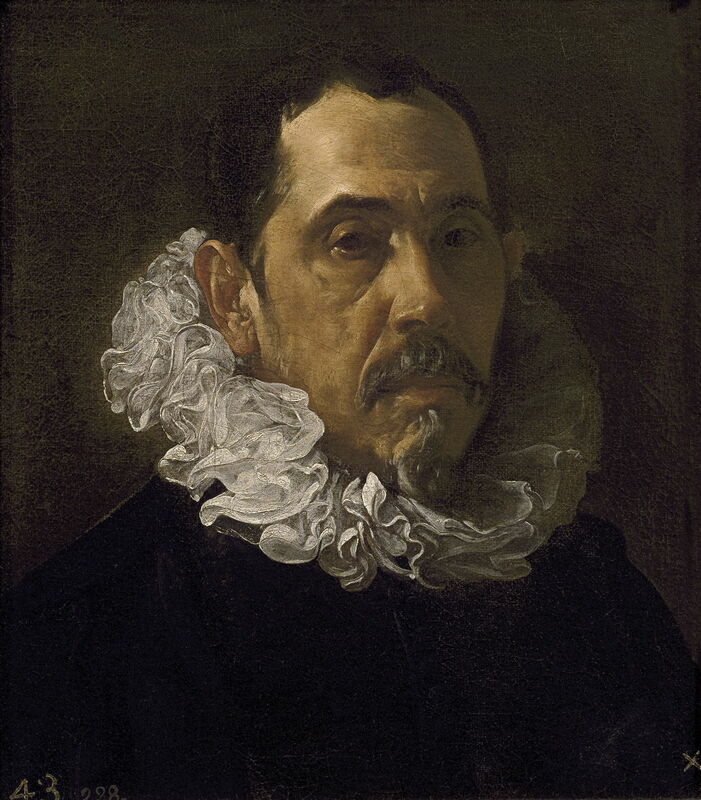 Pacheco here wears a gorguera or ruff, which is executed in a painterly manner. The gorguera was formally banned throughout Spain in 1623, putting a fairly secure upper limit on this painting’s date. In 1621, King Philip III died unexpectedly, and was succeeded by Philip IV, who was only sixteen at the time. Velázquez aspired to paint at the court, and in 1622 travelled to Madrid to try to gain admission to the new royal court. He failed at this first attempt, so returned to Seville, where he tried to strengthen his influence with the Count of Olivares, who dealt with most affairs of state for the young monarch. Velázquez’s father-in-law had painted the Count’s portrait in 1610, giving him a valuable introduction. In 1623, Velázquez headed off to Madrid a second time, meeting with success. On 6 October 1623, he was appointed a Painter Royal, and embarked on his long career at court with his major patron, Philip IV. Diego Velázquez (1599–1660), Philip IV, Standing (1624) , oil on canvas, 200 x 102.9 cm, The Metropolitan Museum of Art, New York, NY. Wikimedia Commons. 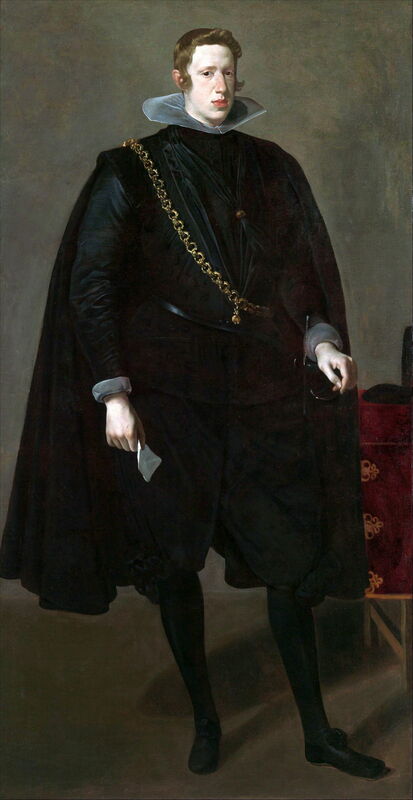 Philip IV, Standing (1624) is one of Velázquez’s first portraits of the monarch, and is recorded as being formally accepted in December 1624. One of the mysteries surrounding this work is its extensive pentimenti. It has been suggested that it wasn’t intended for open display, but as a model for the workshop. However, examination has shown that the changes, which bring greater realism in the king’s Habsburg facial features, weren’t made until four years later, probably in 1627-28. The reason remains a puzzle. Diego Velázquez (1599–1660), Portrait of the Count-Duke of Olivares (1624) , oil on canvas, 206 x 106 cm, Museu de Arte de São Paulo (MASP), São Paulo, Brazil. Wikimedia Commons. 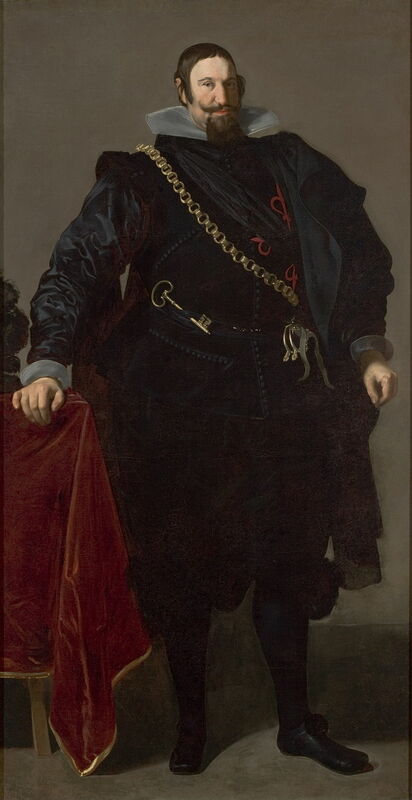 At around the same time, Velázquez painted the king’s most trusted advisor, in his Portrait of the Count-Duke of Olivares (1624). It was he whose influence had secured the artist his place at court, and this portrait was intended as a pendant to that of the king, both being commissioned by Don García Pérez de Araciel, who was a close advisor to the Count of Olivares. Velázquez was not the only painter at court. He had reached the bottom rung of that ladder, and his eyes were now set firmly at its top. Posted in General, Life, Painting and tagged bodegone, Pacheco, painting, Spain, Velázquez. Bookmark the permalink.